One of my favorite things about visiting Rafe at the home he shares with his mother, is perusing her years of Bon Appetit, Gourmet, and Cooks Illustrated archives. Lee has had a Bon Appetit subscription for at least 10 years (as far as I can tell from her magazine library.) And between her status as a long standing subscriber, and likely also due to the end of Gourmet magazine last November (R.I.P. old friend) - The publisher's gave her the option of renewing, and giving a free gift subscription! (JACKPOT). 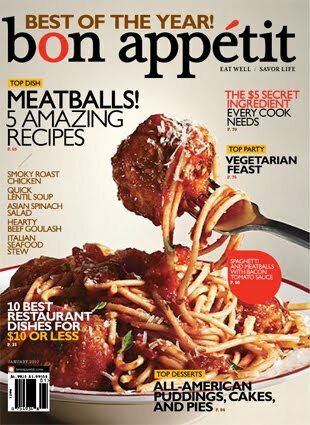 One of my first issues of the magazine boasted 5 amazing meatball recipes. I was very eager to try one - and when I saw that one meatball recipe depicted a meatball in sandwich form (I LOVE SANDWICHES) I decided that the Pork Meatball Banh Mi would be the most exciting and different from any other meatball sandwich I've eaten before. To make the sandwich, the meatballs are layered onto a baguette accompanied by some sriracha mayo and lightly pickled veggies. Rafe doesn't do mayo (he's actually horribly put off by mayo and cannot stand it in any application) so I subbed some plain yogurt mixed with sriracha for him, and he loved it. The recipe calls for carrots and daikon radish, but I couldn't find daikon, so I subbed cucumber because I thought it would hold up well in a quick pickle....and add some additional CRUNCH! Rafe was in charge of the pickled veggies and did a fabulous job. This sandwich was delicious - and definitely earned its spot on The Clean Plate Club...the recipe makes 4 sandwiches, there were 2 of us....and no leftovers. I remember drooling when I read this issue! Your pork meatball banh mi sandwich looks divine!